Last week was busy, to put it mildly! All the humans were sick with a nasty cold. To make matters even more complicated, our 11-year-old cat, who is normally the resilient one in our merry band, got very sick! Not eating, not drinking, limp tail, no energy… you name it, he had it! We were quite worried for him. So, my cold notwithstanding, I took him to the vet. Now, a week later, we are all healthy and happy and he is back to being his old, curmudgeonly self again, much to the delight of everyone in this house! And, sure enough, there are! For instance, look at this beauty! 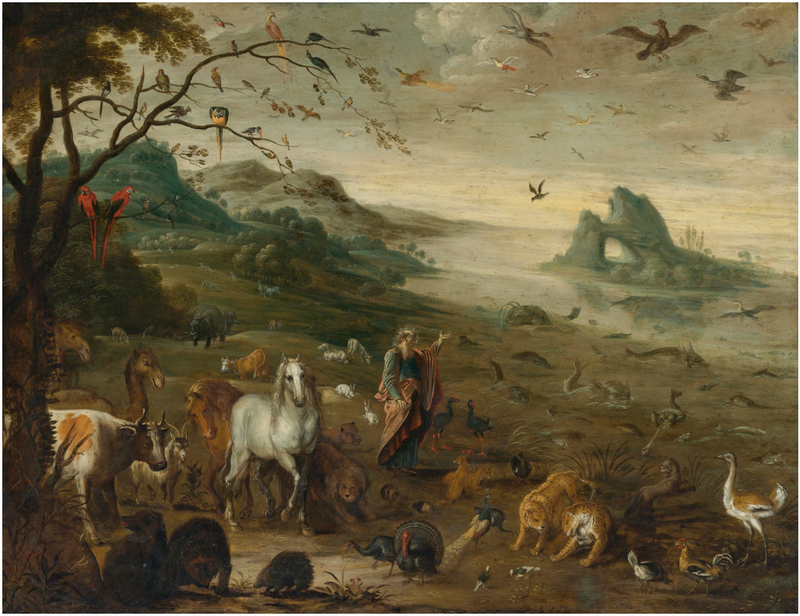 God Creating the Animals of the World, by Isaak van Oosten, c. 17th century. Private collection. It’s a beautiful painting by a Flemish artist. One of the things I find amusing about this painting, in particular, is that so many animals in the New World (aka, the Americas) are present in this painting. In fact, I was surprised to find out that the painter, Isaak van Oosten, had spent much of his life in Antwerp, Belgium. Yet, there are parrots and turkeys in this painting, which are definitely birds that came from America! It is yet another reminder how the Americas captured the imagination of many Europeans. But it’s not just the Americas that he borrowed from! In fact, he tried to put a whole range of birds from many places which would be considered exotic in Belgium in the 17th century, as well as animals considered commonplace, such as chicken and cows. Why? To emphasize that God created everything. From the boring to the novelty, God had His hand in everything. Thank you for creating all the world, especially the animals that we share this world with! May we be good stewards to creation, just as You intended us to be.